The Focal Point of your surgery! Whether buying a new chair and considering a new colour scheme, using an older chair or for longer surgery procedures requiring optimum patient comfort. Dentifab has the skills, expertise and a huge range of genuine factory-original fabrics to choose from. Dentifab directly imports quality materials in a large range of colours from around the globe. 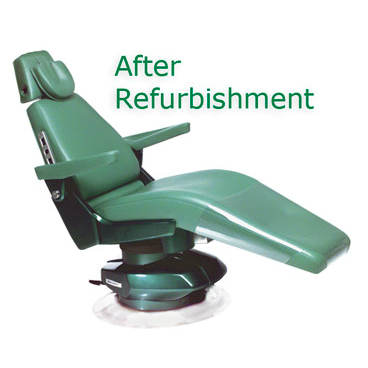 For many years now the craftsmen at Dentifab have been quietly revolutionising the focal point of your surgery, your patient’s chair. With today’s emphasis on asepsis control, tatty upholstery does little for your clientele’s impression of the high standards that you are seeking to maintain. However, many of the older chairs are still giving faithful and reliable service, while the idea of upgrading seems a costly exercise. Here is where Dentifab steps in. You will be delighted to discover how cost-effective it is to refurbish your existing chair, and amused at how many of your clients will compliment you on your ‘new’ one! Brand new chairs are at times furbished with upholstery sets to Dentifab’s exacting high standards in customer colour choices prior to delivery. A popular option is to upgrade foamwork with thermo sensitive technology padding that optimises patients comfort for longer surgery procedures. Dentifab’s Technology, developed in-house enables us in many cases to produce fully moulded seamless upholstery on a low volume basis. 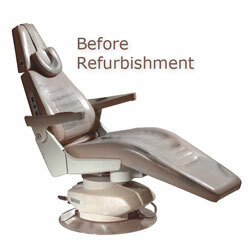 The upper part of the headrest professionally removed facilitates modern dentistry by providing additional clearance around the top of the chair. A real back saver, eliminating the need to bend over to the patient. Faded, dull or chipped paintwork is refinished using modern automotive technology. A hardwearing, clear coat applied over the base colour gives depth and durability. Our combined service of upholstery and paint refinishing offers the opportunity to completely change the colour scheme to suit your decor. Your clients feel more at ease placing their footwear on one of our Clear Plastic Covers. Protects your upholstery from scuffing and sharp heels. Our multifit covers have a sleek modern style that enhances the appearance of any chair, and are easily fitted due to an adjustable velcro fastening system. Please contact the friendly staff at Dentifab and have them discuss the options available. Dentifab is a division of Medifab, bringing you quality dental and medical furnishings.